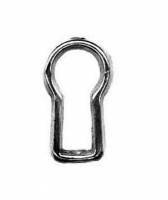 Locks & keys, escutcheons, eyes & hooks, latches, moldings, liners, etc. Description: Cast brass insert type keyhole escutcheon is used to protect wood cases from keys. Measures 11/16" tall. Description: Stamped brass insert type keyhole escutcheon is used to protect wood cases from keys. Measures 13/16" tall.